If you happen to be one of those people who simply must dip your lips in a pint of green beer this St. Patrick's Day, why not do it while knowing a little bit of the history behind the emerald elixir? By all accounts, these crafty concoctions got their start during the early 1900s (as you'll see in the snippets below), but you might not realize that a former brewery in North Texas plays a small part in the story as well. Plano's Reinheitsgebot Brewing Co. was the first microbrewery in Texas, not to mention the sixth one ever to open in the United States. And, believe it or not, the company once produced the only bottled green beer in the country. Collin County Emerald was an all-malt beverage crafted for St. Patrick's Day in the mid-1980s. It was packaged and sold in clear glass bottles, which came complete with a Leprechaun on the label. Image info: Snapshot taken from an original, unused bottle label. 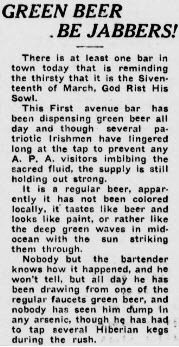 America's first exposure to green beer appears to have happened in Spokane, Washington in 1910. 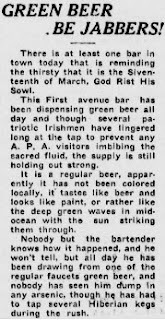 That year, a local bar poured a beer with an apparently naturally-occuring shade of green, which...when combined with the imagery of a beer that "looks like paint"...makes you wonder what exactly patrons were being exposed to while drinking this beer. Image info: Article snapshot taken from the March 17, 1910 edition of The Press, a newspaper out of Spokane, Washington. Click here to access the article by way of The Library of Congress. 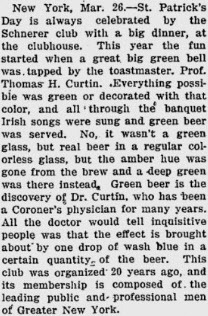 Long about 1914, a man by the name of Thomas H. Curtin created a green beer by adding a bit of blue dye to a glass of amber-hued lager. The coloring agent, wash blue, was and still is a product used to improve the appearance of certain fabrics. No word on whether or not it had any effect on the taste of the beer. Image info: Article snapshot taken from the March 26, 1914 edition of The Independent, a newspaper based in St. Petersburg, Florida. Click here to access the article by way of Google News.